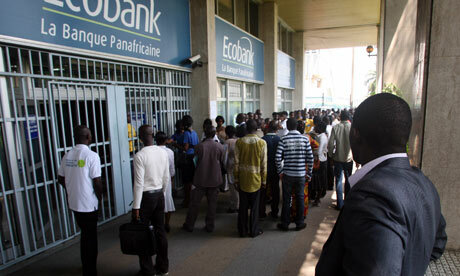 People queued to withdraw their savings in Ivory Coast amid rumours of a cash shortage, as a third bank shut its doors on Wednesday amid a political crisis in the country. The British bank Standard Chartered suspended operations in Ivory Coast, joining two other banks, BICICI and Citibank, and the regional stock exchange. Two months after a contested presidential election that led the incumbent leader, Laurent Gbagbo, to refuse to cede power, international financial pressure supporting his opponent, Alassane Ouattara, has finally made its presence felt after his troops seized the regional stock exchange. Crowds scoured Abidjan for working cash machines. Crowds formed and several banks closed their metal gates to prevent the front doors being rushed. Of thirteen banks visited in Abidjan Wednesday, eleven were open for business, though only four had working banking machines, according to an Associated Press tally. A manager at the Ivorian Chamber of Commerce and Industry said he was certain nearly every bank would close in coming days. He asked not to be named because of the sensitivity of the issue. The Central Bank of West African States, known by its French acronym BCEAO, endorsed Ouattara’s victory in November’s election nearly two months ago but didn’t succeed in cutting Gbagbo off from state coffers until it fired its president, a close Gbagbo ally accused of funneling money to his friend, in January. Gbagbo reacted by seizing the central bank’s offices in Ivory Coast, but the electronic financial regulation system, controlled from the head office in Dakar, Senegal, was cut off. The European Union has imposed a visa ban and financial sanctions on Gbagbo and dozens of members of his inner circle. It has also prohibited any European companies from doing business with a long list of top officials and institutions accused of propping up Gbagbo’s regime. The US has also announced a visa ban on a shorter list of Gbagbo allies. While the Chamber of Commerce says less than 5% of Ivorians hold bank accounts, those accounts “feed the rest of the economy,” said Boka, estimating that one bank account may support 50 people or more, both family members and informal employees paid in cash. “It’s really only the civil servants and the army that have bank accounts,” she said. But they support dozens of workers such as mechanics and mobile phone credit vendors. Meanwhile, bank managers have been quietly leaving the country ever since the BCEAO threatened criminal proceedings against any bank doing business with Gbagbo’s central bank, said a Western diplomat who asked not to be named because he is not permitted to speak with the press. Two managers were stopped at the airport this weekend, the diplomat said, and prevented from leaving by police officers loyal to Gbagbo. Late Tuesday, the regional stock exchange, the BVRM, announced that it would also suspend all trading in Abidjan after Gbagbo-friendly troops seized the building last week. While the Abidjan trading floor was open on Wednesday, journalists were not allowed to enter the building. “It’s possible that the exchange has been opened by those that illegally occupy it, but there are no transactions being carried out,” said Lene Sebgo, chairman of the exchange’s board of directors. “No quotes will be accepted and only the situation and the data up to February 11 will be recorded,” he said. Computer printouts posted at many bank branches informed clients of reduced banking hours. At one downtown branch of the SIB bank, the crowd grew angry after security stopped allowing people in a few minutes before the 3pm closing time. “It’s not even closing time yet and they’re already cutting us off,” said Moussa Traore, a retiree. “How am I going to pay for food for my family?” he said.